When I arrived in October we had four days of rain. We got here, on the heels of damage, caused by sixty inches of water, in six days. Many had lost their homes. This was on the wake of Hurricane Irma back home, in Florida. We had just survived that near disaster. The full moon loomed. She was a creature of the night. She was an intricate piece of the jungle puzzle. She was Juliann. Life is all about ” how you see it.” Your personal view on things. I walked yesterday morning to a spot, that I calculate daily, suspending the morning light; a stratum of pink and peach hues, that veil the mountains, boats and sea. This photo, in no way, exhibits what I see. Soon, I will try another angle. Picture this ~ A world with no cameras. I have not been able to upload pics to my blog, since arriving, in Costa Rica. Today, I have been here one week. This alteration, of my posts, has interrupted my life, like the internet has twisted my reading. It’s an upheaval. This visual denial has shifted my thinking. My brain is climbing the Continental Divide. I rely on my photos to not only tell my story, but to allow the reader to create, with their imagination, a hybrid. A creation of their own, that I do not control, nor do I want to. That’s what my posts are all about. Sharing my thoughts and my life with others, but in an artistic manner, that allows the reader to choose their own interpretation. That is art. And what is life without art. I think I am going to break out my paints. 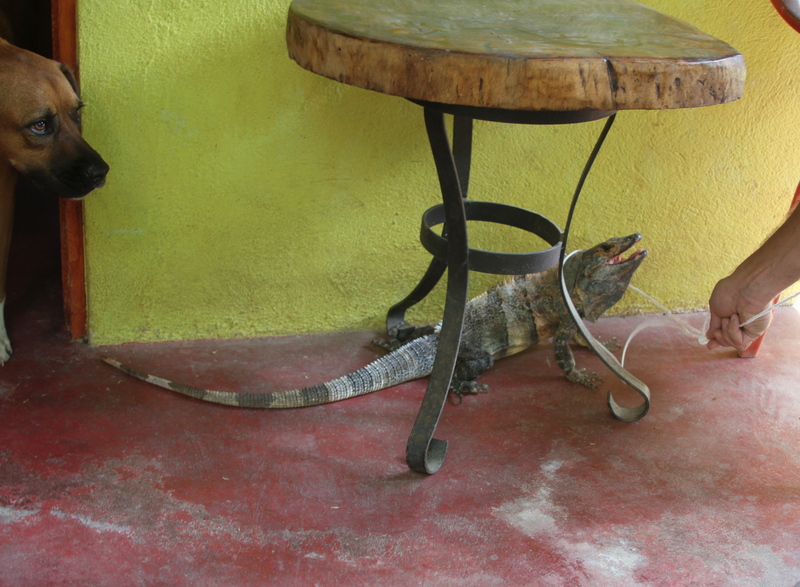 There is an abundance of iguanas in Costa Rica. It takes a while to get use to that fact. Actually, it takes a while to get use to all the wild life in Costa Rica. At one time, I felt as if I was living in the pages of a national geographic magazine. However, some of that feeling has dissipated, due to the development in the Guanacaste area where I live. And some of it is due to becoming accustomed to life in Central America. One day, returning from a trip to Santa Cruz, the municipal seat of our area, a huge, blue iguana fell out of a tree and landed on the hood of our 76 Land Rover. Just a few more seconds and it would have been in my lap. That was terrifying. What are the odds of that happening? Iguanas are a formidable looking, prehistoric-like, scaly, big lizard. I have so many of them around my house, because I live on the edge of a farm. To the right of me is old Costa Rica; to the left, the new. For that reason, I have a lot of animals here on my little postage stamp property. Also, they love my garden and home. When I first put my garden in, I had to stack up rocks in preparation of defending my plants. Around three, every afternoon they would wake up and come out of their fallen logs, to eat my flowers. I was not going to let that happen. It actually was kind of fun. I didn’t really having anything better to do. It worked. All of my plants can fend for themselves now. When I first lived in this house and the beams of the roof were still exposed, I could look up and see the tail of a brown lizard wrapped around the wood. He was up there and I was in my bed, so I just let it be. I ended up naming him Lynard, for Lynard Skynard, as I’m from the westside of Jacksonville, Florida, home of the southern, rock band. His presence was kind of comforting. Eventually, Lynard left and was replaced by a bigger lizard. Now, I know it was a bigger lizard, because I saw it rather than just hear it, rustling around in the rafters. 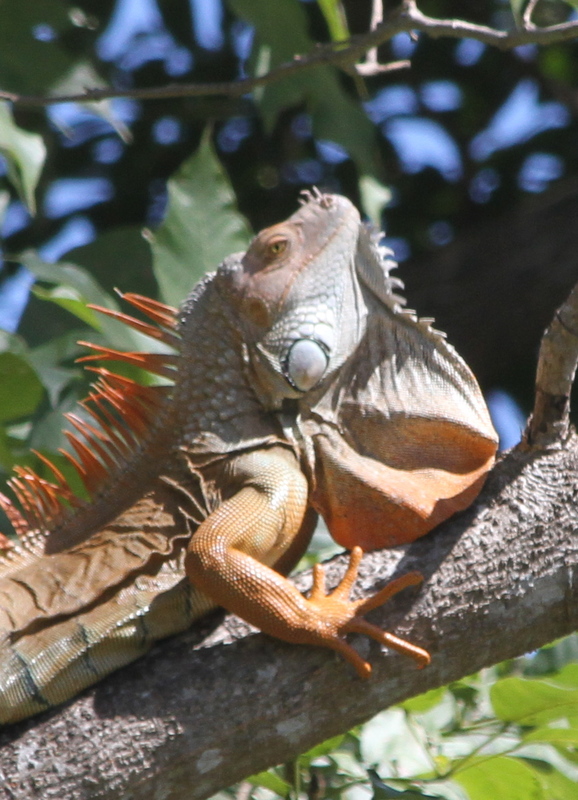 When I pulled up in to the yard today, the dog was barking and the children were squealing, IGUANA, IGUANA!…. Meet my longtime house guest, whom I have no name for. He looks harmless and I’m sure he is, but I had a hard time walking around him to get in my door. They just look so creepy. He looked as if he would spring and attack, but I guess that wasn’t the case. This freeloader was lassoed and escorted to the street. This guy, who also posed for the top picture, has been circling my house for the last few days. He appears to be aggressive. I think I need to put out a no vacancy~then I’ll have just enough time to go see the sunset! Have a good day and have a GREAT year.